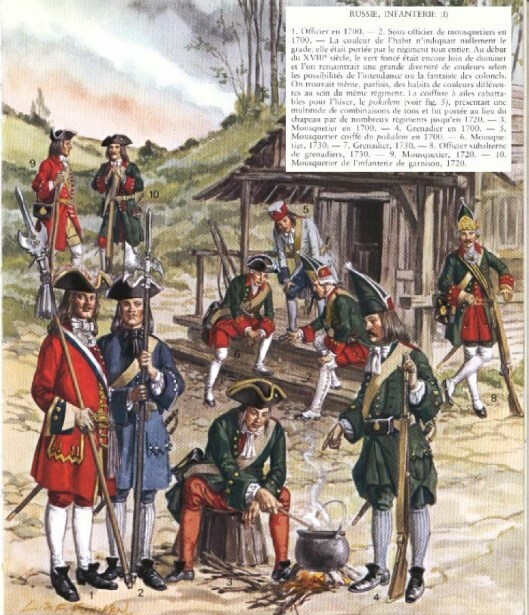 Russian Guards of the 18th Century. #6 is an Izmailovskii Guards grenadier. Peter I thus inherited the structure and core of a modern standing army built along Western lines. It “stood” only in theory though, and because of the limited and irregular training, its performance was erratic. Russian soldiers were noted as stout fighters, particularly on the defensive, but they frequently panicked and broke formation. The quality of officers, both foreign and Russian, varied widely. Even the best, however, were often ham- strung by the centralized system of command Aleksei Mikhailovich had implemented, where directives from Moscow overrode decisions in the field no matter how distant the campaign was. It might fairly be said then, that Peter the Great stabilized and standardized the Russian army rather than creating it. He brought it from a skeletal force to a true standing army consistently capable of fighting successfully against European opponents. Peter’s earliest initiatives replaced the Streltsy , who had risen in favor of his sister Sophia, with the Preobrazhensky and Semeonovsky Guards regiments as the core of the army. These regiments had been the “play- things” of his youth, drilled and outfitted ac- cording to Western standards; now they were the model for his real army. He re-implemented conscription and made service year- round; these peasant levies were augmented with volunteers, and led by officers drawn from the lower nobility who received basic training as privates before being promoted. Otherwise, they closely resembled army regiments from the later period of Aleksei Mikhailovich’s reign. Peter’s army, however, was a truly permanent force of much greater size and (eventually) ability. 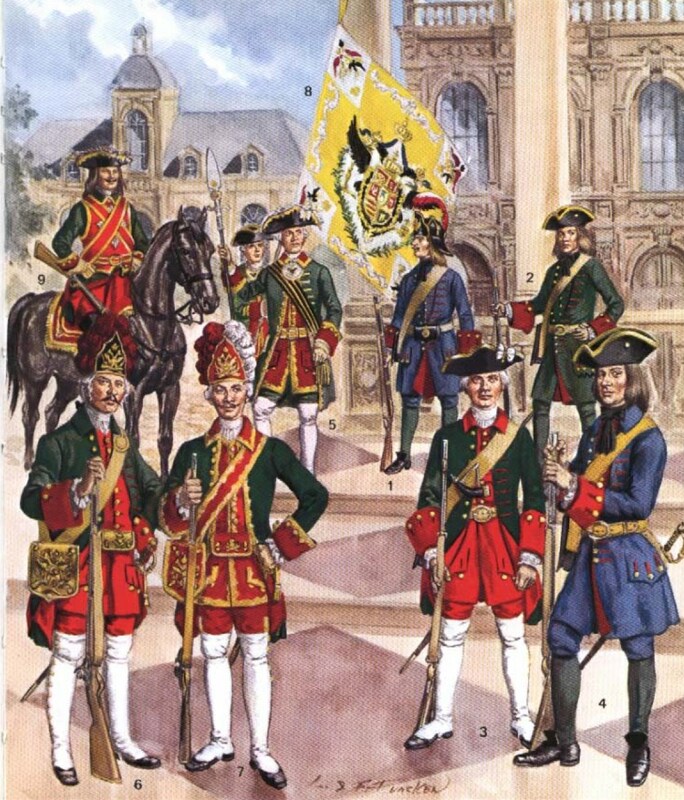 When he launched the initial campaign of the Great Northern War against Sweden in 1700, the Russian army counted the two Guards regiments, two supporting regiments of Guards dragoons, and 27 infantry regiments organized into three divisions. Another 10 infantry and 9 cavalry regiments were added during the first year of the conflict. Between 1705 and 1710, Peter added another 20 infantry regiments and, in a marked departure from the Western model, 26 cavalry regiments. The latter were all light cavalry units, useful in the broad, sparsely populated expanses of southern and western Russia that Peter aimed to take. Musketeer units, the basis of Aleksei Mikhailovich’s force, still existed in small numbers. Regular units no longer served in garrisons, however, as new resident militia formations were (landesmilitsia) created for that purpose. Over the course of the war, Peter’s army became increasingly flexible and diverse. Dragoons, by definition, can serve un- mounted as infantry, but Peter often deployed infantry regiments on horseback as well. Distinct artillery units were formed for the first time, but almost any unit of the army could be assigned any task at any given time. Infantry served on the ships of Peter’s new navy, performed hard labor in St. Petersburg, and augmented garrisons along the southern frontier during campaigns. This lack of specialization was matched by an increasing lack of social segregation within the military as it expanded. Members of the lower gentry and freedmen (taxpayers) were enrolled in the infantry as heavy cavalry units disappeared and the distinction between infantry and cavalry blurred. The sons of the nobility now served as junior officers in the regiments at the beginning of their career, rather than forming separate cavalry units; on a few occasions, they even served in units alongside Cossacks. Even the officer corps was not socially exclusive though, as there were hardly enough nobles and sons of nobles to fill the many slots pro- vided by the growing force. By the time of Peter’s death, roughly one- third of the officer corps was of nonnoble lineage, although the increase in administrative officer posts accounted for some of this. The officer corps remained a bastion of the social elites nonetheless, particularly after the Table of Ranks defined the relationship between military rank and social status, but Peter’s army was by- and-large a mass of un- differentiated troops. To support it, Peter had implemented the hated soul tax- a general levy against the number of serfs owned or people supported- and ripped soldiers away from their families via conscription and full- time service which, even though Peter had reduced the term of service to 25 years, was generally viewed as a death sentence. The army’s size and flexibility, however, freed Russia from the generally defensive posture it had been forced to adopt previously. With a sizeable standing army equally capable of fighting European or Tatar forces, Russia was set to emerge as a power to be reckoned with in Europe, and in the world. During the 1730s and 1740s, Russian power projected into central Europe on several occasions, although Peter’s heirs were far less able in military matters. It was during the Seven Years’ War (better known in Russia as “The Prussian War”) that the Russian army truly came of age though. Nearly 500,000 men served in the Russian military during the conflict; many of them were drawn from the garrison forces that had been designed to provide a reserve of trained troops. Carrying out a series of campaigns deep inside Polish and Prussian territory, they demonstrated remarkable endurance, marching on average 30 kilometers per day, and recorded a few forced marches of 40 kilometers a day. In battle, their artillery was unmatched, firing at a top rate of 18 rounds per minute. The accuracy of Russian musket fire was questionable at best, however, and a great deal of the success the army enjoyed was due to the stalwart nature of the Russian soldier. The logistical organization of the army was weak, and soldiers survived for most of the campaign on biscuit and kasha; troops carried 10 days’ supply on their backs, and the regimental wagon trains carried another 20 days’ worth. Rations were seldom fulfilled, however, and troops often had to live off the land for extended periods. Attempts to supply the army by sea failed when Danzig refused to accommodate Russian ships and an attempt to take Kolberg failed in 1758. Poor roads, rough terrain, and uncertain weather further conspired against the Russian supply efforts. The Russian armies nevertheless fought steadfastly and, in most respects, outperformed the forces of the vaunted Frederick II (the Great) of Prussia. 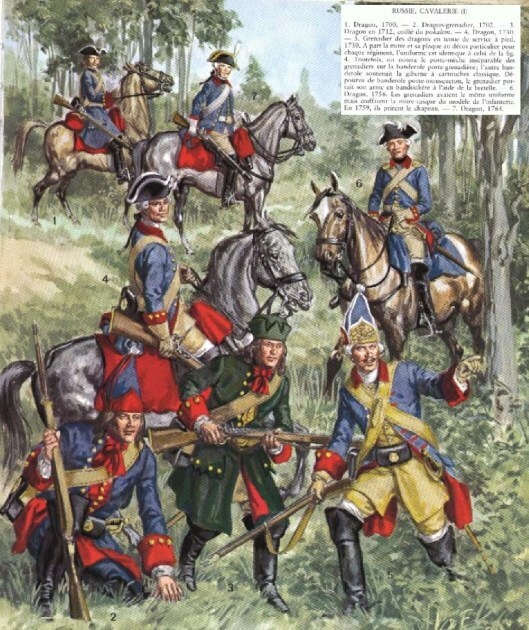 They fought to draws at Gross Jaegersdorf (1757) and Zorndorf (1758), defeated the Prussians soundly at Paltzig and Kunersdorf (both 1759), occupied East Prussia, raided Berlin, and appeared ready to deal Prussian ambitions a death blow in 1762. In December 1761 (January 1762 by the Western calendar), however, Czarina Elizabeth I passed away; she was succeeded by Peter III, an ardent admirer of Prussia. He immediately took Russia out of the war- which almost certainly saved Prussia from collapse- and was preparing to switch sides when he was de- posed. The Prussian War thus demonstrated the capabilities of Peter’s army and Russia’s weight in European affairs. The experience of the Seven Years’ War also gave rise to a new generation of Russian commanders, more able and innovative than any before. The most prominent among them were Pyotr Rumiantsev and Aleksandr Suvarov, and they changed not just the tac- tics of the Russian army, but its ethos. Suvarov, in particular, had a lasting influence. In addition to adopting the Western method of attack in columns, preceded by skirmishers, Suvarov instilled in the Russian army a discipline and morale not seen again until Soviet days. Suvarov’s system centered on troop morale, and stressed their well- being both in peace and in preparation for battle. He emphasized rapid maneuvers and decisive attacks, training his troops to attack in bayonet charges rather than relying on fire- power. “The bullet is a fool, the bayonet a hero” became the watchword of the Russian army during the next century, for better or for worse. The “Suvarov Period,” although brief, in many ways marked the high point for the Imperial Russian Army. The Russians easily defeated much larger Ottoman forces during the Russo- Turkish War of 1768- 1774, crushed two rebellions in Poland, and thus added huge swaths of territory to the Russian Empire under Catherine II (the Great). Even the armies of revolutionary France proved no match for the Russians. During 1799, Suvorov led the Russian army to a series of victories in Italy, driving the French from the peninsula. Suvarov’s career ended on a sour note, as an ill- advised campaign in Switzerland led to his defeat and retirement, but the overall result vindicated the reforms of Peter the Great. This entry was posted in Armies, Russia by MSW. Bookmark the permalink.